Following are some of the primary factors we considered when selecting our top 10 backpacks (for men) list. Please see our complete backpack buying guide for more information on how we chose, and you should choose the right backpack for your hiking or camping adventure. There’s a reason why backpacking and hiking are considered two separate disciplines by outdoors junkies: The backpack. A day hiker can carry everything they need to get from trailhead to destination and back in the same pack that a fourth grader carries to school every day. But when it comes to multi-day trips with everything needed for human survival on your back, the pack becomes the integral piece of equipment that allows you to enjoy all your time away from the comforts of civilization. With that in mind, it’s vitally important that you choose the right backpack for you and the expeditions you’re planning on taking. The right pack filled with the right equipment can be the difference between a comfortable, exciting trip and a miserable one (or the difference between a safe trip and a hazardous one). Use these rules when considering the pack you’re going to buy, and always be sure to put on a few packs at your local retailer as well to get a feel for their features. The most important factor to consider when choosing a pack? Comfort, comfort, comfort. You’re going to be carrying everything you need to survive on your back; depending on the nature of your gear, you could have as much as 90 pounds in that bag. While every spine is unique in the way it interacts with a pack, one backpack fact is universal: The more points of contact between the load and your body, the less pressure on each individual point. Try lifting a loaded grocery bag with one finger sometime, then do so again using your whole hand. Much easier, right? Extend the same concept to a backpack. A multi-day pack will have a hip belt, which encircles your waist and transfers the weight of the load onto your hips; the ubiquitous shoulder straps and a sternum strap, which crosses from one shoulder strap to the other across your chest and takes pressure off your shoulder muscles. Make sure you check those points of contact when you’re shopping around for a pack. Do the shoulder straps sit comfortably? Where on your chest does the sternum strap cross, and is that a spot that won’t chafe when you’re wearing the pack eight hours a day? And most of all, the hip belt. Backpacks are designed with a frame system to help transfer weight down the side closest to your body (hereafter referred to as the front), and eventually that weight is transferred onto the hip belt. This is good – the muscles in your legs and the bones in your pelvis and thighs are much stronger than your back and shoulders, and they are much better-equipped to bear weight for a long day of hiking. The hip belt should be able to fit snugly, resting just atop your hip bones on both sides. Again, test the belt for chafe points (although any good backpack is designed with ample padding in the hip area) and be sure that it doesn’t slide down below the crest of your hips (which will render its load-transfer feature worthless). All the straps should be adjustable; test the straps for the ease of adjustment as well. Next, the frame. The front of the backpack can be shaped to the intricacies of your spine, which will further the comfort when carrying a load. If you’re buying from a retailer, be sure to ask them to help you custom-fit the pack. Some packs have flexible metal rods that run vertically down the front and can be bent to mimic the curves of your spine; some have removable pads that can actually be heated in an oven and then formed to your lumbar region. The more space inside of your pack, the more stuff you can carry. Again, refer to the wide variance in gear you’ll need based on where you travel. A pack with 4,000 to 5,000 cubic inches is considered appropriate for a trip of five to seven days under summer conditions (bear in mind that in the mountains, it can get cold any time of the year). You have to decide for yourself how much you want to carry. A larger pack with more bells and whistles can allow you to carry additional gear for a mountaineering expedition or a two-week backpacking epic, but that’s more weight on your back. Even the best load-transfer system can’t hide the fact that you’re carrying 30 to 40 percent of your own body weight on your back. 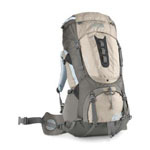 Some packs have a large aperture at the top through which all gear must pass; some are compartmentalized with a separate space at the bottom that opens onto the back side of the pack. Usually this compartment is designed to hold a sleeping bag. Many packs have side zippers in this area even if the pack has just one large compartment. There are also smaller pockets on the sides as well as pockets in the “brain” (a smaller component that covers the top of the main compartment). 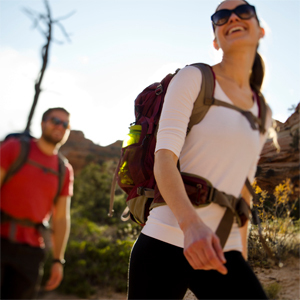 You won’t survive on a backpacking trip without ample water, so make sure that your pack can carry it. Packs typically have water bottle pouches on each side just above the hip belt; make sure that these pouches are large enough to carry your bottles. Also, many newer packs are designed to carry a water bladder on the interior, with a hose that hangs around your neck area for easy drinking while walking. Whether you’re carrying a bulky sleeping pad, extra pair of shoes or sandals or a bulky cookpot that doesn’t readily fit inside your pack, it’s helpful to have numerous tie-down straps on the back side of your pack. In addition to allowing you to carry more gear than the internal volume would suggest, these straps can also be tightened down to stabilize your load. Remember, always keep in mind what you’re using the pack for. Also consider that extra features are generally easier to live with than live without; generally, the trade-off for additional features is extra weight and increased cost.